. . .No, not Trinitrotoluene, the explosive but Télévision Numérique Terrestre – digital TV. Time is running out for the analogue signal here and after September there will not be a choice so when we saw a dear little digibox priced at 19 euros we bought it. It was worth a try and cheaper than buying a new telly. Bear seems unable to grasp the concept of digital television, despite the fact that we had a digibox when we lived in England and, although I’ve tried to explain several times, he keeps asking me if it will interfere with the satellite reception. A TV engineer who came to sort out some problems with the satellite told us that digital reception was poor in our village so I wasn’t over optimistic that our aerial in the loft would suffice. Anyway, once home, it was down to me to set it up and by some miracle it worked straight away and the picture is superb. In addition we can get channels that were very poor by analogue plus the dozen or so ‘extra’ programmes on offer. The only problem is that we now have to use four remote controls and (maybe my connection isn’t absolutely comme il faut) using the Skybox automatically cuts out the digibox and the DVD player and if the digibox is ‘on’, nothing else will work. This means that I am in constant demand from both Bear and Whale when they want to watch TV since Whale still hasn’t mastered the use of his Skybox. And no, I’m not going to fix up a digibox to his TV. He doesn’t watch French programmes anyway. It’s some time since I had a little moan about Bear and, in all fairness, he hasn’t been too bad these last months. However, our weekly lunches à deux at the local restaurant often turn into an opportunity for him to let off steam. Take today: he suddenly launched into the usual invective aimed at Whale, CC and Jay but mostly Whale. “I can’t bear the sight of him”. It seemed better not to say that he might have trouble doing that since he gets up much later than I do and sleeps for most of the afternoon. And there was June gone! Whatever happened to June? I remember realising that it had begun and before I knew it, here we are a week into July. So what’s been going on? Nothing terribly exciting I’m afraid. 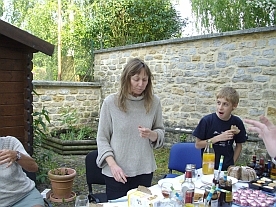 There was the meal with the Club de Troisieme Age with langue de boeuf as the main course so Bear refused to try it. The couple opposite us were 80 and 83 but didn’t look a day over 60. When the president gave out tokens for the Dodgem cars (it had been the Village Fete the previous weekend) they were among the ten or so ‘oldsters’ to take up the offer. As for me, I didn’t want to risk it and was content to go outside and watch. 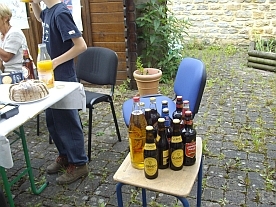 Then we had an end of term English cheese and beer tasting for the classes at the library. CC and Jay brought a selection of cheese, beer and pickles back from their trip to England. They bought stilton, cheddar and cheshire cheese and a variety of pickles incuding Branston, Piccalilli, pickled eggs and pickle onions as these are things you don’t find in France. 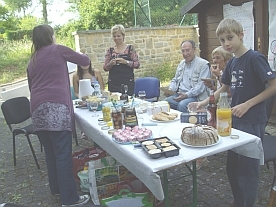 There were several types of biscuits for cheese and Tunnocks Teacakes and Golden Syrup cake for those with a sweet tooth. It was decided that the ‘rite of passage’ was to eat a pickled onion without spitting it out and Isabelle just about managed it. Fortunately she likes beer and so was able to wash it down quickly. The chickens are now all moved to the back part of the garden with a temporary fence and fingers crossed that they won’t escape again. The white ones had found a way of getting underneath so we’ve put in 40 extra staples. The ground is so uneven that they found it easy to dig underneath. 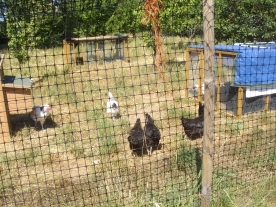 I wasn’t sure how the four adult black hens and the eight young chickens would get on but after a few stand offs they seem to have settled down. They still tend to go round in two ‘gangs’ and I have to try to feed them seperately or else the black ones won’t allow the white ones anywhere near. They have all investigated each other’s living quarters but they go to bed in their ‘own’ houses. It looks pretty certain that there are at least 4 cockerels among the youngsters and we are coming round to the idea that some of them may be eaten. . . . . . The cherry trees were more productive this year. We had two handfuls from each of the ‘eating’ cherry trees but the sour cherry tree excelled itself and we now have 14 pots of (rather runny) cherry jam. There is still lots of fruit on the higher branches but I’m not sure I could face another session over a hot stove especially as Yvette let us pick her remaining redcurrants and that resulted in 8 pots of red currant jelly. 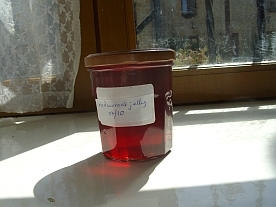 It’s the first time I’ve attempted to make jelly and I’m proud of the fact that it’s beautifully clear – and set! The heatwave looks set to continue and we have had little or no rain for ages. This is so unlike our famously rainy weather and I’m worried the well will run dry as I have to water frequently. 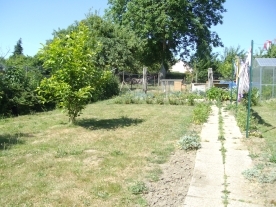 The good news is that we haven’t had to mow the grass for some time. But the weeds still grow, alas!